The TV-bred Wells...has written and directed The Company Men without ever coloring outside the lines: it’s all a bit too neat and obvious and predictable. 113 min. The Weinstein Company. Director: John Wells. 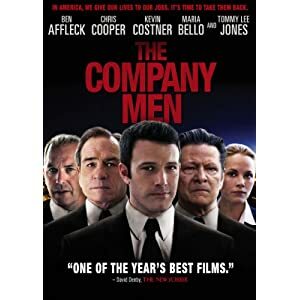 Cast: Ben Affleck, Tommy Lee Jones, Chris Cooper, Craig T. Nelson, Maria Bello. 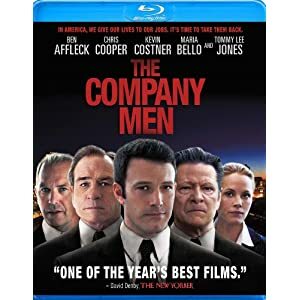 Recession-era America finally gets, in The Company Men, a movie that squarely addresses recession-era America. But now that it’s here, it’s a bit hard to imagine who would want to see it. Those folks hit hardest by the recession won’t put their discretionary dollars to seeing John Wells’ drama, and why should they? They’re living their own catharsis. I suppose working-class folks may go to laugh and point at fallen executives (that’s entertainment?). But I’m betting the most likely audience for this one will be people like Wells himself: comfortably wealthy individuals putting in liberal-guilt time and/or executives in need of assuagement that they’re still good people in a dog-fire-dog economy. Wells makes it abundantly clear that Bobby is a guy desperately in need of some humility. Accustomed to his lifestyle, he refuses to give up his country-club membership or consider selling his house, and getting the Porsche detailed never seemed more like a defense mechanism. The bubble of Bobby’s denial eventually bursts, as he processes the concern and hurt of his wife (Rosemary DeWitt) and teenage son Drew (Anthony O’Leary). Having first sneered at the offer, Bobby crawls back to his blue-collar brother-in-law Jack (Kevin Costner) for construction work; it’s one in a series of “indignities” that gets Bobby, once a “Master of the Universe” in training, back in touch with the human race. The early movements of The Company Men generate some interest with the semi-absurdist space of the job center and the suspense of how far into trouble Gene’s conscience will push him (some of that trouble involves Maria Bello’s exec, who draws up the layoff lists; Gene’s trysting with her behind the back of his socialite wife). Less suspenseful is the character arc of Gene’s friend Phil (Chris Cooper), an account rep whose long-term loyalty to the company means he’s an expensive—and therefore eminently expendable—employee: another betrayed company man, he’s unprepared for the cruelty of today’s job market. Wells structures his story to transparently didactic ends. After establishing Bobby as a horrible person, Wells allows him sunny redemption: call it character shading, optimism, or a cop out, but neither Wells nor Affleck can make it ring true. Similarly, the film’s inspirational ending plays like wishful thinking, but at least it’s in tune with the rising chorus of these dark financial days, singing of a sensible scale of back-to-basics business in homegrown production. Anchor Bay deals out an impressively crisp hi-def transfer for The Company Men. Rock-solid contrast and good black level and shadow detail contribute to the firmness of the image, which shows no digital artifacts to speak of; the hues on display are also natural and strikingly vibrant. The lossless DTS-HD Master Audio 5.1 mix seems unintentionally to have deprioritized the dialogue a bit: it doesn't always rise above the other elements as distinctly as it should. (Perhaps someone was overcompensating for the film's talkiness by playing up the ambient soundscapes?) Still, this is a strong A/V presentation overall, and certainly a significant step up from the DVD equivalent. The disc also includes a feature commentary with writer/director John Wells. Wells is a good talker and a practiced advocate for his film and its exploration of themes, so this is a track that will be of no small interest to the film's enthusiasts (or fans of Wells, in general). Also on hand are an "Alternate Ending" (12:52, SD) that amounts to a slightly different edit of the final ending, six "Deleted Scenes" (7:16, SD) that are more intriguing snips, and featurette "Making The Company Men" (14:23, SD), with behind-the-scenes glimpses and interview clips of Ben Affleck, Wells, Maria Bello, Chris Cooper, Rosemarie DeWitt, Tommy Lee Jones, Kevin Costner, and Eamonn Walker. All site content © 2000-2019 Peter Canavese. Page generated at 04/18/2019 01:21:13AM.